If you’ve ever taken your car through a typical car wash, toward the end a certain piece of equipment was used to help dry the wet car off. At that moment you were experiencing a real world, practical application of a centrifugal fan. Thanks to rotating impellers, centrifugal fans are able to increase the speed and volume of an air stream. As a mechanical device for moving air (or other gases), centrifugal fans are often known by a simpler name: blowers. There are two common types of fans: axial and centrifugal. Axial fans utilize aerodynamic lift created by blades, kind of like the way airplane wings work. Axial fans are uniquely designed to create a voluminous air flow rate, albeit at low pressure speeds. Centrifugal fans rely on blades to drag air into a circular motion with centrifugal forces speeding up airflow radially and outwards. These fans move air outward thorough ducts or tubes, and they provide a stronger and more stable air flow than axial fans do. In the HVAC industry centrifugal fans are prevalent. You’re likely to find them incorporated into building ventilation systems. Meanwhile, they’re often used for industrial processes to transport gas or materials. Air pollution control systems also utilize centrifugal fans. They work well for dust control. Centrifugal blowers can be found with air conveyor systems, on cooling and drying systems, and in use for fluid bed aerators. Filter flushing, gas boosting, and sewage aeration are some other uses for them. Other places where you’re likely to find centrifugal fans in use include inside air conditioning units and furnaces, hair dryers, and in VW or Porsche engines. The pressure to volume curve is the key: centrifugal fans work better than axial types when working against a high pressure drop. 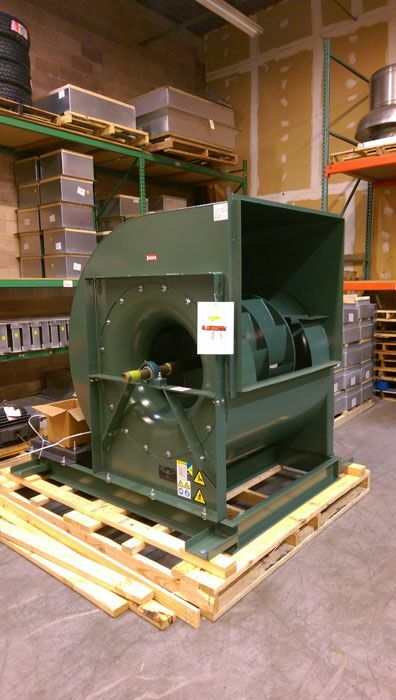 Dynamic Fan has been supplying centrifugal fans to countless businesses throughout the state of New Jersey for over three decades. As a one-stop-shop for commercial fan needs, Dynamic Fan not only sells fans, but also installs, repairs and maintains them. Working in the commercial, institutional and industrial markets, Dynamic Fan can provide you with exactly what you need. Besides centrifugal fans, Dynamic Fan deals with industrial exhaust, ventilation and restaurant fans. Have a fan question? Please call Dynamic Fan at 973-244-2422. ← What Are the Differences Between Centrifugal and Axial Fans?